The past two weeks I have been on the road, traveling to Chicago and Orlando to speak at two very different ag data conferences. The first was the Big Data Dairy Management conference held by the American Dairy Science Association. The second was AgGateway's annual conference. The audiences were different, but many of the issues were the same. Here are few of my reflections. Dairy has been collecting data for a long time, but the legal discussion over ownership, usage, and control of ag data lags the row crop industry. The Dairy Herd Improvement Association, or DHIA, has been collecting herd information for decades to improve milk quality and cow quality. Farmers can participate in this program and choose to share information, or they can opt out. Similarly, new data platforms are arriving each year to address other data streams off the farm. A great example from the conference is Moooggggle. But I gather while the data from dairies has been collected for years, the discussion over who owns this data is relatively new. Maybe dairy farmers lack their row-crop farmer counterpart's concern, but I doubt it. My presentation about ag data transparency efforts generated a lot of interest. The Internet of Things (IoT) is going to be transformative for dairy farms, perhaps more than any other farm sector. As these new devices connect data from cows, milking robots, and all corners of the farm, I think we'll see more interest ag data privacy, security and transparency issues. AgGateway is a well organized industry-wide consortium to address the compatibility and interoperability issues with ag data. AgGateway is focuses mainly on machine, climate, and agronomic data (but I have a feeling livestock data will be a talking point in the future). AgGateway is making big strides to address these issues through efforts like ADAPT, although much work still needs to be done. Overall, I was impressed with how far AgGateway has come since it was founded about 15 years ago. One of the most interesting comments from the AgGateway conference was from Brad Keywell, a speaker and founder of Uptake, a data analytics platform. He said that agriculture is leading the national discussion on data ownership and privacy issues. I have always heard the opposite--other industries have already solved the issues agriculture is now confronting--but Brad was insistent that was not the case. And upon reflection, I think he is right. 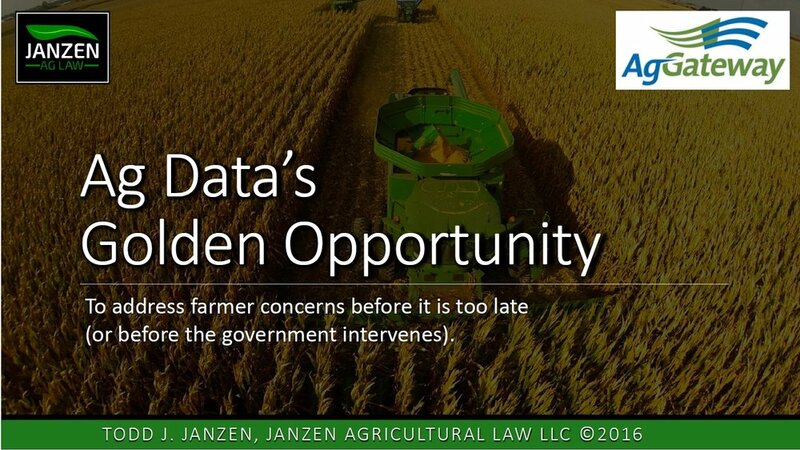 All of this convinces me that the theme of my presentation to AgGateway was on point--we have arrived at Ag Data's Golden Opportunity. We have a choice today to decide whether we are going to treat ag data as a commodity, owned by the farmer, and licensed to ag technology providers so that they can return value to the farmer and promote agricultural advancement, or we can ignore these issues and let ag data slip into just another stream of consumer data, owned by the companies that sell us their software and hardware. Which way will the industry go? I look forward to finding out. PS: If you are ever in Orlando for a few days, Kennedy Space Center is only a one hour drive away. For anyone who grew up seeing Apollo or Space Shuttle launches, it is a must see.